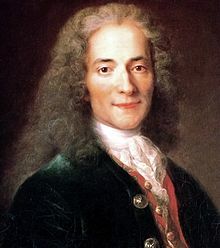 François-Marie Arouet, better known by the pen name ‘Voltaire‘, was a French Enlightenment writer, historian and philosopher famous for his wit, for his advocacy of civil liberties, including freedom of religion, freedom of expression, free trade, separation of church and state, and his attacks on the established Catholic Church. In his opinion, the French bourgeoisie were too small and ineffective, the aristocracy were parasitic and corrupt, the commoners were superstitious and ignorant, and the church was a static force only useful as a counterbalance since its “religious tax”, or the tithe, helped to cement a power base against the monarchy. Voltaire distrusted the democratic ways of governance. He said that democracy was propagating the idiocy of the masses. He essentially believed monarchy to be the key to progress and change. Voltaire is quoted as saying that he “would rather obey one lion, than 200 rats (of his own species)“. Thomas Carlyle, who argued that while Voltaire was unsurpassed in literary form, not even the most elaborate of his works was of much value for matter, and that he had never come up with any significant idea of his own.